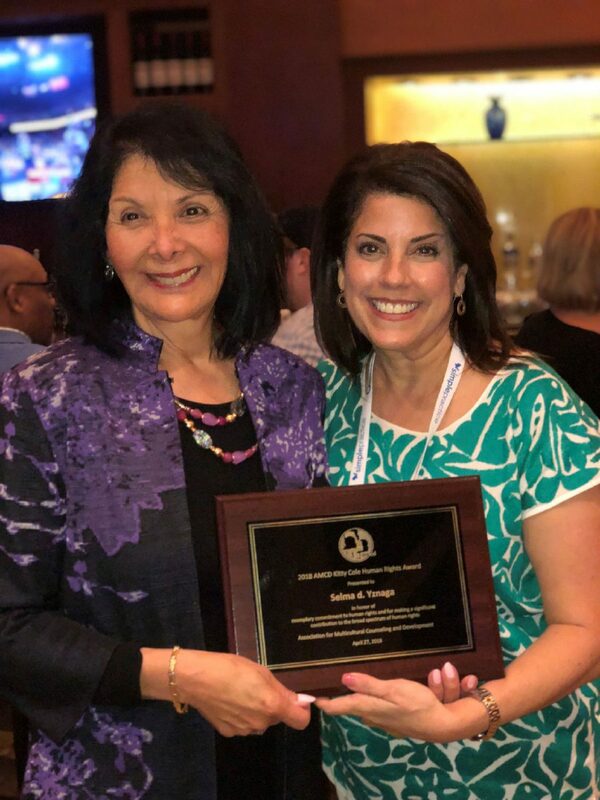 Dr. Selma Yznaga (at right), associate professor of counseling at The University of Texas Rio Grande Valley, has been awarded the 2018 Kitty Cole Human Rights Award by the Association for Multicultural Counseling and Development. Pictured at the award ceremony are Yznaga and colleague Dr. Patricia Arredondo, special advisor to the dean for Academic Affairs at Fielding Graduate University, who nominated Yznaga for the award. BROWNSVILLE — Splitting her time between advocacy work and teaching has taught Selma Yznaga, associate professor of counseling at University of Texas Rio Grande Valley, the commonalities between two of her passions, counseling and social justice, as well as the clear distinctions. Yznaga, a Brownsville native, is the recipient of the 2018 Kitty Cole Humanitarian Rights Award by the Association of Multicultural Counseling and Development, an award given to members who’ve made significant contributions to one or more areas of human rights, according to the association’s description of the award. In the case of Yznaga, her passion for volunteerism led her first to lend a hand at the Buena Vida Housing Development in Brownsville, as well as training future volunteers at the Young Center for Immigrant Children’s Rights since the center was in its initial development stages. Her volunteer work had to be put on hold as her career took a turn towards administration at the university becoming more demanding, but two years ago Yznaga returned to teaching and decided to go back to volunteering knowing exactly where to serve first. The Young Center for Immigrant Children’s Rights aims to protect and promote the best interest of unaccompanied children who are immigration proceedings. The center assigns bilingual volunteers as Child Advocates, along with social workers and attorneys to advocate for their best interest “from custody and release to the ultimate decision about whether the child will be allowed to remain in the U.S.” the center’s website states. So far, Yznaga has been assigned four children. Most are long-term relationships, she said, as one of the children was under her care as a volunteer for over a year, as this particular little girls’ final detention stay was of 450 days. Her shortest assignment, she said, was of about a month. When it comes to the collision of her two passions, Yznaga said she always has to remember that her role as a volunteer is not the same as her role as a counselor and as a college professor. The basic counseling skills do relate to most volunteer work, she said, like those of being non-judgmental, being authentic and having positive regards for people. But counseling has a very different process starting with an assessment of the client’s needs, goal setting, interventions and evaluations, which doesn’t happen when your main goal is to be a child’s main support system. Aside from working with the children at the center, she also works with other groups such as the nonprofit Frontera Aid, which is currently raising funds to help provide basic needs families stuck in detention centers, in border cities or even out in international bridges waiting for answers, among other groups and organizations. Yznaga believes that advocacy work and volunteerism do impact her work as a counselor and professor in a positive way by being able to do what she describes as “walking the talk.” A huge part of counseling is advocacy, she explained, and multiculturalism and social justice have become an increasingly important aspect of the counseling profession as there is more awareness of people’s issues coming from the systems and structures that they live in.